more screenshots from Google Chrome OS can be found here. Consumers won’t be able to download and install Chrome OS on just about any system they like. It will be available next year only through OEMs channel and on the hardware that meets Google’s specifications. Google, though has release the source code for Chrome OS and it can now be downloaded through the link given below. UPDATE 1: Google Chrome OS VMware Image is out now! and can be downloaded from here. UPDATE 2: Follow the complete step-by-step guide posted here on How-to install Chrome OS in Windows 7. Talk about big brother. All this is, is another way for google to serve up ads. They are in every prt of my life and I dont like it anymore. Schoolboy, no one is making you have to use google chrome os. They do it so that you would use their search engine, so that you remember them. I doubt that they are going to have adds over the OS, as it would be pretty unprofessional. You can aways use yahoo or bing if cyberdyne is too much for you! 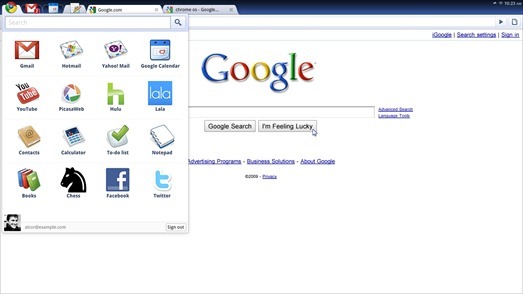 This is NOT an “OS” its a friggen web browser! 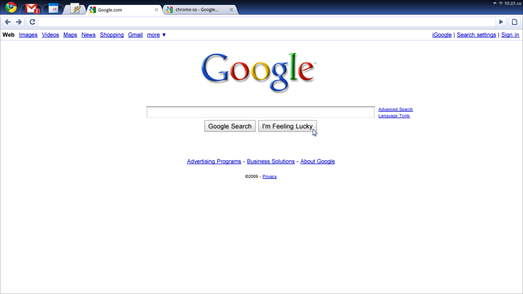 Google search engine as a desktop? Give me a break..